Happy Friday! Hope you all had a fabulous New Year's Eve and New Years Day. T & I hosted a small dinner party on NYE rather than trying to get a last minute reservation and having to go outside to brave the chilly northwest Iowa elements. On the menu were several delicious morsels that will likely be repeated at some point so that I can have a chance to blog about them rather than just stress about having everything ready at the appropriate time (hurray for double ovens!). All in all, the night was a success. T got a chance to bust out his new copper Moscow Mule mugs, we enjoyed the many one-liners of the classic Back to the Future, and had our first overnight guests in the new casa. Truth. Speaking of the elements outside of late, T & I are seriously over the cold negative degree weather. What better than a warm slow cooker recipe to make the house smell delicious all day? This Asian-inspired slow cooker recipe for sweet garlic chicken is absolutely yummy, and super easy to throw together. Step Two: Place the chicken in a lined slow cooker, then mix up the sauce in a small bowl. Step Three: Pour the sauce over the chicken, and set slow cooker to low for 6-8 hours, or high for 4 hours. Step Four: When the chicken is done cooking, remove to a heated plate and tent with foil. Pour the remaining liquid into a saucepan over high heat, and bring to a boil. Boil until sauce has reduced to a glaze. It will continue to thicken after removing from the heat. 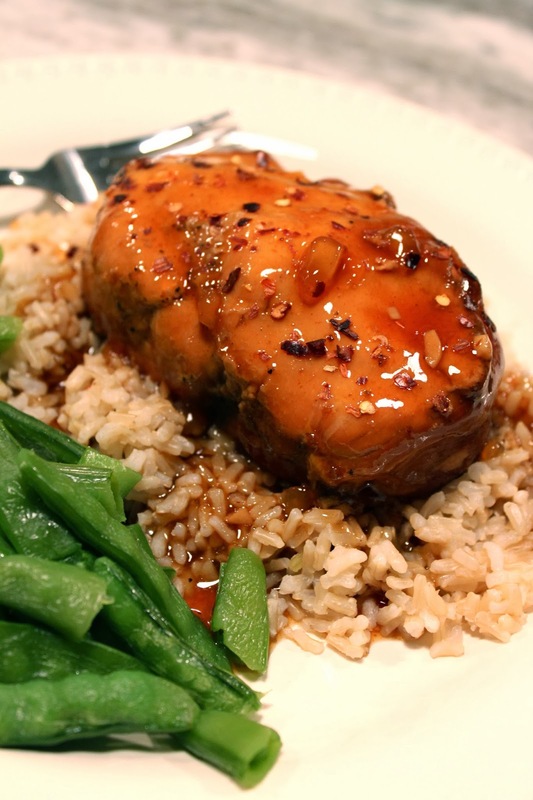 Serve chicken over brown or white rice with a generous serving of glaze. Sprinkle with red pepper flakes to balance out the sweet with some spice. I would also recommend serving with steamed snap peas or broccoli as a side. Yum. Yum. Line slow cooker with a liner. Place chicken (frozen, thawed or fresh) inside slow cooker. In a medium sized bowl, mix together brown sugar, vinegar, soda, garlic, soy sauce and pepper. Pour over chicken. Cook on low 6-8 hours, or high for 4 hours. Remove chicken from slow cooker to a warm plate, and tent with foil. Pour remaining sauce into a medium saucepan over high heat. Whisk together corn starch and water in a small bowl, pour into the saucepan, and mix well to combine and help thicken. Bring sauce to a boil, stirring frequently, until it starts to thicken into a glaze. Remove from heat and let sit for a couple of minutes. Sauce will continue to thicken as it cools. Serve chicken over brown or white rice, spoon the delicious glaze over the top, and sprinkle with red pepper flakes to add a little spice to the sweetness of the sauce. I would also recommend steamed snap peas or broccoli as a side. Do you have any favorite slow cooker recipes?